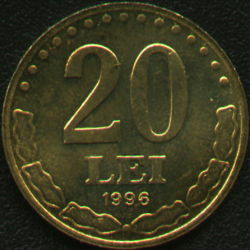 denomination "20 LEI" and year 1996, a wreath formed by six stylized oak leaves, a sector of 15 pearls above ROMANIA, ŞTEFAN CEL MARE meaning STEPHEN THE GREAT, two seven pearl sectors, bust of Stephen the Great and the Holy. Over the left shoulder lies C.D. standing for Constantin Dumitrescu, the engraver's name. The coin struck in 1996 is rare, being struck only 500.000 pieces. In 1994 and 1995 were struck several milions and in the others tens of milions of coins. 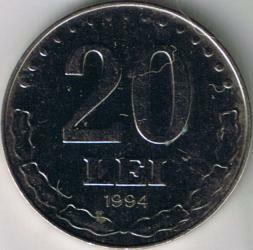 The 1991 coins were released into circulation on 9th of September that year. 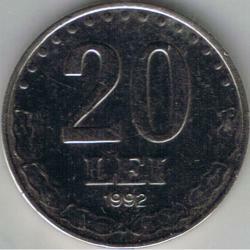 The information concerning the estimated mintage figures for the coins struck after 1989 is given after "Standard Catalog of World Coins", editor G. Cuhaj. The great Moldavian voivod is also present on other Romanian coins: 500 lei 1941 - Liberation of the enthralled Moldavia, 5000 lei 2004 - Stephen the Great's Death Quincentenary, 1 leu, 5 and 100 lei 2007 - 550 years since the enthronement of Stephen the Great in Moldavia and 10 lei 2008 - Voroneţ Monastery. 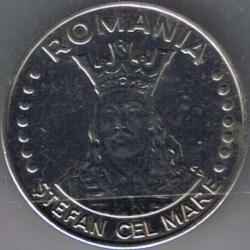 Stephen the Great also appears on several coin issued by the Republic of Moldavia: 100 lei 2000 - 525 years from the battle of Vaslui and 100 lei 2004 - 500 years since his death. 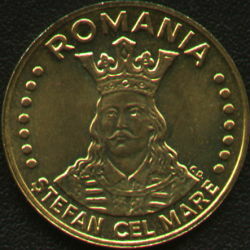 The 20 lei 1992 and 1994 nickel plated steel essays above are present on Romanian coins through the kind permission of Mr. sebii. Numerous statues honor today the memory of Stephen the Great. 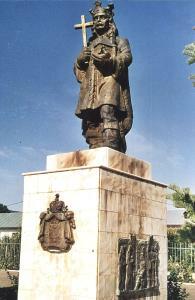 The statues of Iaşi, Piatra Neamţ, Suceava, Chişinău and Huşi can be seen in the picture below. 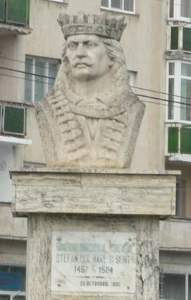 In the last picture several statues are presented: the statue from the center of the city of Vaslui, the monument from Podu Înalt near Vaslui, the statue from Podu Înalt (detail) and the second statue of Stephen the Great from Iaşi, on the Copou hill. 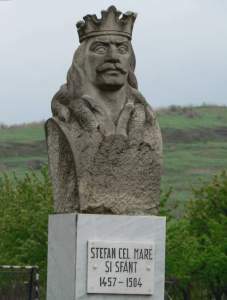 The equestrian statue from Podu Înalt near Vaslui - work of Romanian artist Mircea Ştefanescu - is the biggest statue of Stephen, having almost 7 meters high and weighing 19 tons. In addition, the statue is placed on a 8 meters high socle. The socle is placed atop a hill near the road. In front of the monument burns a flame of eternal gratitude dedicated to the great hero of Romanians. 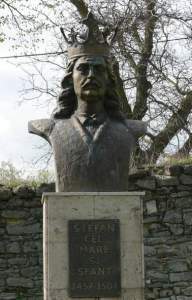 In the county of Iaşi several busts of Stephen the Great exist. Above are pictured the ones from the yard of Dobrovăţ Monastery, from Hîrlău and Cotnari.